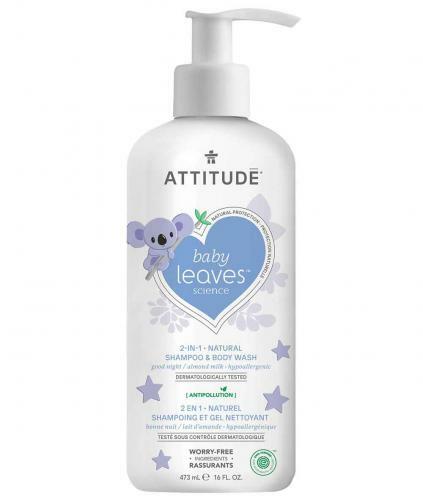 EWG scientists reviewed ATTITUDE baby leaves 2in1 Shampoo, good night / almond milk for safety according to the methodology outlined in our Skin Deep Cosmetics Database. We assess the ingredients listed on the labels of personal care products based on data in toxicity and regulatory databases, government and health agency assessments and the open scientific literature. ATTITUDE baby leaves 2in1 Shampoo, good night / almond milk is EWG VERIFIED™. Aqua / water / eau, sodium coco-sulfate, coco glucoside, glycerin, sodium cocoyl isethionate, sodium chloride, citric acid, glyceryl oleate, sodium benzoate, potassium sorbate, vaccinium angustifolium (blueberry / bleuet) leaf extract, inulin, chamomilla recutita (matricaria) flower extract, maltodextrin, cyamopsis tetragonoba (guar) gum, moringa oleifera seed extract, linalyl acetate (herbal), vanillin. DIRECTIONS: Pump a small amount into your hand or wet washcloth and massage lather onto skin and hair. Rinse well with water.